I don't post recipes very often, but you know that when I do, they're easy to make and don't require much effort or many ingredients. But for today's recipe I'm making an exception, because for some things there's simply no shortcut. These Vietnamese-inspired rice paper rolls (also called summer rolls) are filled with colourful and flavourful ingredients, which is not only a pleasure to the eye but also the tastebuds. It's requires some prepping but your guests/partner/friends/family will be seriously impressed. I made them vegan-proof but you can easily add some meat or fish to them. Let's get started.. The ingredients I used for the filling should be available at pretty much every supermarket. Just use whatever you can find. For the rice paper, you might have to make a trip to Chinatown or go to a supermarket which has an 'international/asian' section. You'll need the really thin dried rice paper which you soak in water before use. It sounds like a lot of ingredients now but once you've got them all together, it all comes down to chopping them up, no actual cooking required! This is the biggest chunk of work! I prepped the ingredients one by one on a chopping board and popped them into little bowls ready for filling the rice paper rolls. Use a julienne peeler to slice the carrots into super thin strips. Slice the cucumber into very thin matchsticks. Slice the purple cabbage really thin as well as the spring onions. Wash the lettuce leaves and herbs, and put them in a bowl. Chop the peanuts into rough crumbs. Cook the rice noodles by following the instructions on the package, usually it requires putting them into hot water for a few minutes, then let them cool. Now you've prepped all the fillings and lined them up into small bowls, ready for the real work. Rice paper is a little fickle to work with, but once you get the hang of it it's quite fun. As a surface to prepare the rolls, I used a wooden chopping board. I found out that this is the best surface because the rice paper doesn't stick to it. Fill a shallow bowl with hot water and place one sheet of rice paper in it. Leave it in there for 30 seconds up to a minute, and take it out when it's soft but does not tear easily. You might need to try a few times before you have the perfect timing. Place a sheet on the board as flat and smooth as possible. Now for the fun part. Start filling the rice paper rolls with a little bit of everything. I layered up the vegetables and added very little by little since it gets too full otherwise. I make sure to add a bit of everything, and lots of different herbs for a lot of flavour. 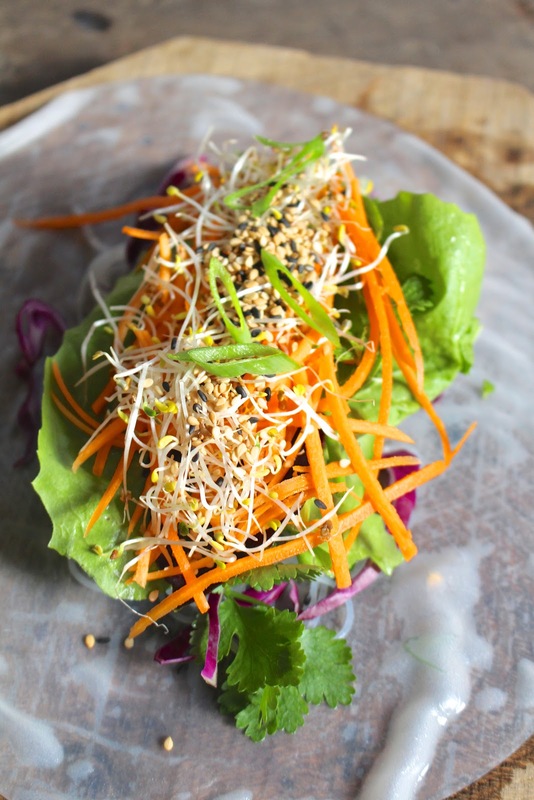 Sprinkle with sprouts, sesame and peanut crumbs at the end and fold over both 'top' parts before rolling it tightly until it's a perfect little package. You can find Youtube videos for the exact method if you're unsure. Do this one by one and pile up the rolls on a plate. If you're eating them later or the day after, wrap the rolls individually in cling film and store them in the fridge. Put the peanuts, lime juice, hoisin sauce and soy sauce in a food processor and blitz until the peanuts have turned into a smooth peanut butter. Add some water to make the sauce more runny and dip-able. Garnish with coriander and peanut crumbs for an extra crunch. Serve the rolls with the peanut sauce and Sriracha sauce, my favourite hot sauce which goes super well with these fresh rolls. You should eat the rolls with your hands, it's the best way to enjoy them! With this recipe I made about 4 rolls per person, which was more than enough. For the meat-lovers I made some rolls with sliced and seared beefsteak, super yummy! You can pretty much make endless variations of this, just add whatever you like. I'm sure that they would be great with extra avocado and mango for example. 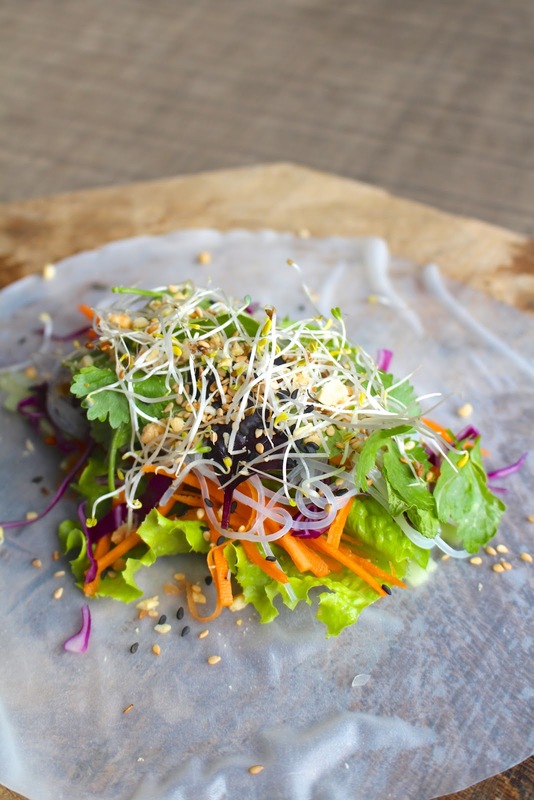 I hope this recipe has inspired you to try making these colourful rice paper rolls. Because of the many ingredients, it doesn't feel like the vegan rolls are 'missing' something. And even though it's more work than your regular lunch/dinner, it's definitely so worth it and not difficult at all!